From the moment Cobra T first appeared on the scene in 1992, its popularity has been utterly overwhelming. Everyone who touches one, seems to want one, and rightly so. But why? Cobra T is one of the only guitars on Earth (maybe the only one) that is a perfect blend between the formidable sonic muscle of a short scale guitar and the musicality of a long scale guitar. And the only way to get this wonderful blend is aboard a Cobra T (or Cobra S). Cobra T is a short scale guitar. A shorter, 24 3/4-inch scale length means less string tension, fatter mids, and greater ease of bending and reaching. Additionally, Cobra T derives much of its muscle and focused, aggressive midrange by virtue of a mahogany foundation. The Cobra body is attentively hand-selected, pure mahogany, crowned by an exotic wood top, usually beautiful, figured maple. 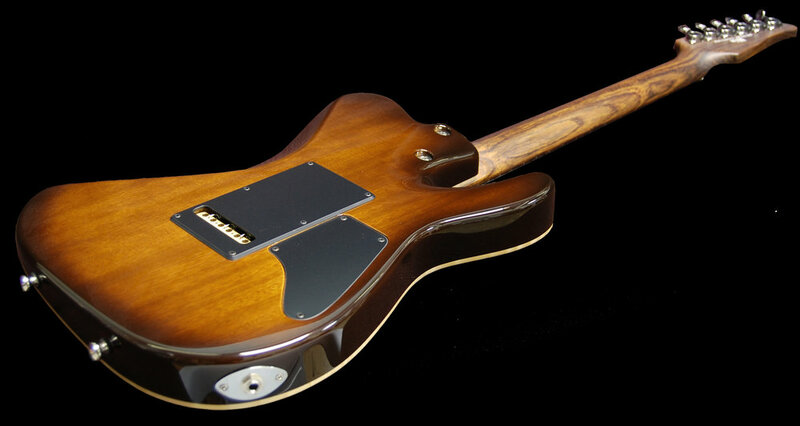 Cobra T's neck is a sleek and fast mahogany back, embraced by a premiere rosewood fingerboard. But Cobra T has a bite that will predominate through any mix, on stage or in the studio, giving more life and dimension to every musical passage, an aspect that is usually difficult for most short-scale, mahogany guitars to achieve. Its geometry grants this gift, with its flat neck to body alignment and string through the body bridge choices, saddle tension is increased and clarity is exalted.